Create your own tsunami today and find out what livin' large is all about! 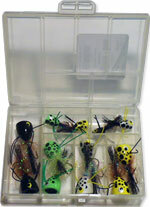 Get the ultimate in cup-faced bass and panfish poppers from FlyBass! Choose from Bass or Panfish size, or get both together! The heads are made from soft polyethelene that float all day and really push water. They sport Super Hair tails which are stiff enough not to wrap around the hook shank. The bodies are laquered to protect the paint. 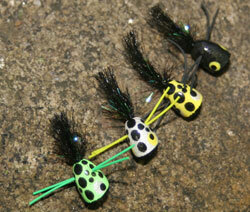 All flies have rugger legs and sparkle hackle for extra pizazz! 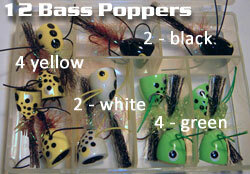 I fish popping bugs aggressively, for bass, so a good solid "pop" is a must on every twitch. The Poison Ivy (Ivie???) delivers. It's simply the most reliable popper I've ever used. 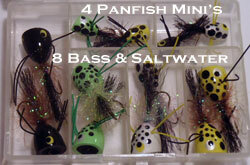 In general, FlyBass is where one comes to find innovative poppers and new patterns for panfish. One of the few places. Brad fishes and you can tell - it makes a difference and these flies will too.